I am the Trail Groove Contest Winner! The Trail Groove web site is a number of things. It is an online magazine, a blog and a forum that is open to the public which was created “to provide a unique online media experience for the backpacking, hiking, and outdoor community.” I first came across the online magazine thanks to a post over on Hike, Bike, Dale! which directed his viewers to the Trail Groove site. Curiously, I flipped through the online pages of the magazine then and was impressed. Then, a few weeks later I came across another post, this time on FaceBook and from the company Trail Designs. They were announcing a Tax Day giveaway that Trail Groove was hosting, and so again I found myself back at the Trail Groove site. Aaron and Jen from Trail Groove had decided to host a Tax Day Giveaway in which I entered. The rules were simple: Sign up at the site, and then post in the forums. Each post counted as one entry. The winner was to be drawn on 4/17/2012 (AKA: Tax Day) via a randomly selected post. 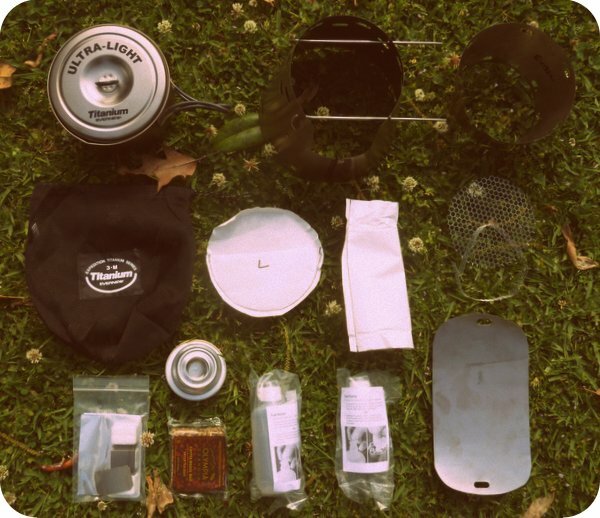 And for the goods… the package that was being given away included a 1.3L Evernew UltraLight Ti cook pot (ECA 253) and the matching Trail Designs Sidewinder Ti-Tri Caldera Cone cook system! Sweet! I signed up and took part in the forums on the Trail Groove website. Then, on Tax Day night, I received an email with the subject line “Sidewinder Winner!” I crossed my fingers and opened up the email…and I WON! WooHoo! Since then I have anxiously awaited its arrival ever since. But the cool thing is, I didn’t even have to wait that long… the drawing was just a few days ago, on Tuesday (17th) and here it is already in my hands, by Saturday (21st). That is impressive! So, I am 99.9% sure that I have found my new 2-person cooking system for sure. I believe that it will be efficient, lightweight and enough volume for 2 (but of course I will test this out for myself though). So, as usual, once I get it out and use it a few times I will post an update to the entire system. This entry was posted in Blogs, Cook Kits, Gear, Gear Reviews, Gear Stores, Give Aways, Stoves and tagged 1.3L Pot, alcohol stoves, Backpacking, Caldera Cone, cook pot, Cooking, Esbit Stoves, Evernew, forums, Gear Review, Giveaway, Gram Cracker Stove, Hiking, Inferno, Online Magazine, Sidewinder Ti-Tri, Solid Fuel Stoves, stoves, Tax Day, titanium, Trail Designs, Trail Groove, Ultralight, Ultralight cook pot, Wood Stoves. Bookmark the permalink. 8 Responses to I am the Trail Groove Contest Winner! I’ve been looking for the weight of this system and just can’t find it anywhere! I tried to find one of your gear lists with this setup, but couldn’t find one. I’d like to know the combined weight of the pot and lid plus the sidewinder and inferno cones, the inferno floor and grates, their tyvek sleeves, and the gram cracker stove. Basically the weight of the setup for wood burning and esbit backup, no alcohol and no stuff sack. Do you happen to have those numbers? Congratulations, Stick, that is an awesome prize to win!! The sidewinder is one sweet setup. Thank you Joslyn! I agree, it is a sweet prize! Congrats Stick, can’t wait to see you use it on your next trip with your son. Thanks Jim! However, I will not be carrying this set-up on the upcoming trip with my son. He wants to carry his own and he is partial to the Jetboil Sol Ti so he will be carrying it. My nephew will carry an extra cook pot and the pot stand for the Jetboil Sol and they will share the stove. So, I will be carrying the Snow Leopard Cooking System from Flat Cat Gear. I love that cook system. My Girlfriend and I used that system on the John Muir Trail last year. You will be amazed how efficient it is, I was able to get a 4 cup boil with less than a oz of Heet. Thanks for the video Aaron! I will definitely check it out in just a little bit. And wow, 4 cups with less than an oz of fuel… That is impressive!